5marcy5 wrote: It seems that for her birthday and for Valentine's Day that they would like to be alone being newlyweds. 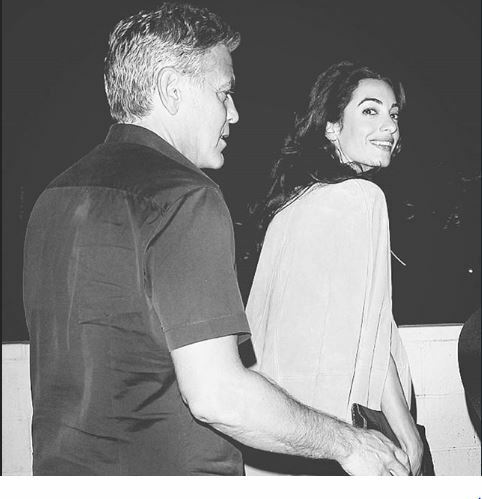 George and Amal can be alone whenever they want to be. If they had friends over for her BD and went out with friends for V Day then that was their personal decision. It certainly doesn't imply anything more than that. We don't know what goes on in their day to day lives. Lol, yup. Most days they probably spend alone together anyway, i mean they live together lol. So if they want to invite some friends over for her birthday I don't see the big deal. As for Valentine's day, we don't actually know what they did for V-day. These pics are from the day AFTER Valentines Day on Sunday.....so maybe they were alone that day or maybe not. Exactly. No one knows how they spent Valentine's Day as they weren't out in public. I think this is old as George has no beart at all. He is shaved in the pic and just couple of days ago he had a beart. If someone can recognise it from where it is I can merge the threads. Yes she is wearing the cape that caused a commotion. Yep, Donnamarie I remember them well. Must be real.No pap show! This was the valentine's dinner.